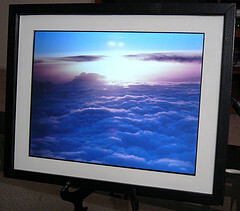 A super-thin clear glass, used in picture framing work. Slightly thicker than 1/16". (Approximately .079"). Two pieces sandwiched together will fit into our #8063 or #8062 "U" channel lead. Depending upon the material you are sandwiching between the glass, you can probably use some of the other lead shapes by opening up the channel slightly. With picture glass you can get interesting effects by enclosing leaves, butterfly wings, flower petals, cob-webs, naughty thoughts and things like that, and can use the panels in candle-chimneys, lanterns, hanging ornaments and the like. 8" x 10" per piece.